Designed for permanent installation, the AKG GN series goosenecks are designed in 3 fixed lengths. 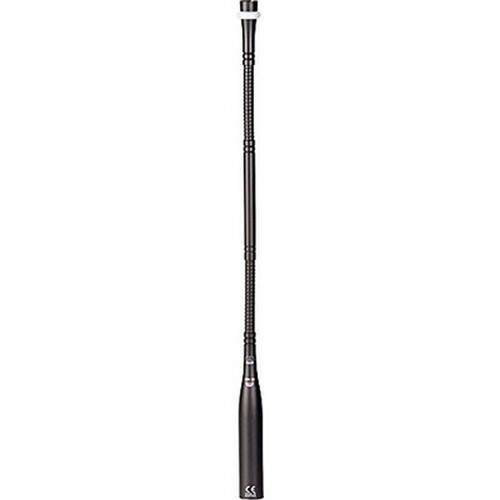 The GN15 measures approximately 6 inches in length, the GN30 is 12 inches and the GN50 is 20 inches. The goosenecks are completely compatible with AKG CK series microphone capsule modules. This model features a 5-pin XLR male output and large LED ring for enhanced visibility. The LED ring indicates an active microphone and the 5-pin XLR connection will carry audio signal as well as power to the LED ring from a separate power supply, e.g., a Logic out from the AS 16 x 12 automatic mixer. The goosenecks feature a bass roll-off switch and quiet gooseneck positioning. The bass roll-off filter eliminates low frequency noise caused by ambiance, ground and structure noise. A 5-pin XLR male output and large LED ring are provided. The LED ring indicates an active microphone and the 5-pin XLR connection will carry audio signal as well as power to the LED ring from a separate power supply. Low frequency roll-off filter switch reduces low frequency noise caused by ambiance, structure noise, etc.